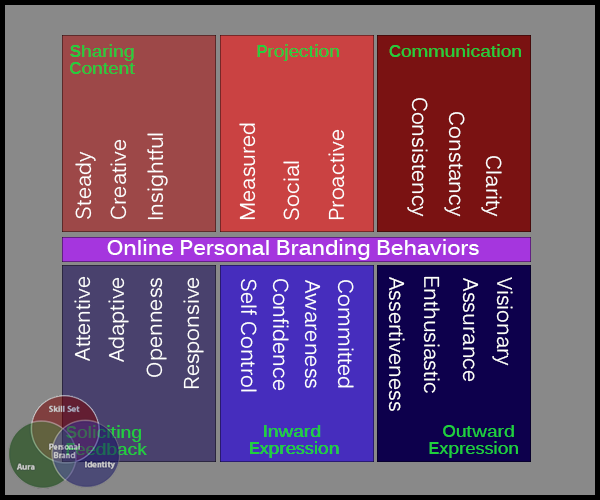 In defining an online personal brand, you lay out a set of expectations so it is important that you behave according to them both online and offline. As more of our interactions move online, there are an increasing number of behaviors to consider. You want to respond to connection invitations in a particular way, perhaps create a new connections policy that defines the criteria for accepting connections. Specify how many new connections you want to make in a given week and stick to it, then think about ways to get to know them. Consider the frequency of your social media interactions. Create a schedule for disseminating new content. Of course, this schedule varies considerably depending on your online personal brand. For example, if you blog, you want to implicitly tell your audience: “you can count on me to deliver a weekly blog post”. There is a big dropout rate for bloggers, so if you can get past the first hump and regularly post a weekly blog, you establish authority and a deeper connection with your readers. So even if you create content in spurts, release it your audience in a stream. Regarding your communications, consider the three Cs of effective personal branding communications: clarity, consistency, and constancy (Salpeter and Morgan 2013). In emails and social media posts, you want to have a clear voice. Your style and delivery should be uniform in your communications. With the majority of online connections, these communications are the only way somebody gets to know you in a personal and professional way; there are no face to face meetings to clarify things. So it is crucial for connections to feel comfortable with you, something that is only accomplished through normalcy and consistency. Make sure there is commonality between your personal website and social media presence. Initially when you first build a personal website and social media profiles, make sure they effectively complement each other. Use the same style and appearance (background image, color scheme, and tagline). Your slogan and elevator pitch should be the same. Then, as your brand evolves, make sure modifications to your personal brand cascades across all portrayals. You want to be adaptable to others’ perceptions of your personal brand. Establishing your personal brand is not analogous to proving a thesis, but rather modifying a perception. So you want to always solicit feedback regarding the effectiveness of your branding efforts. Finally, try to show enthusiasm as you project your personal brand. Be proud of you: who you are and are becoming. Let your target audience get a glimpse of your vision and how you are different from everyone else in the world. Not a lot of people are fans of image building. Though online personal branding is a requirement, especially for the younger generations. The experts say its about being authentic, but there are clearly elements of ‘image building’.